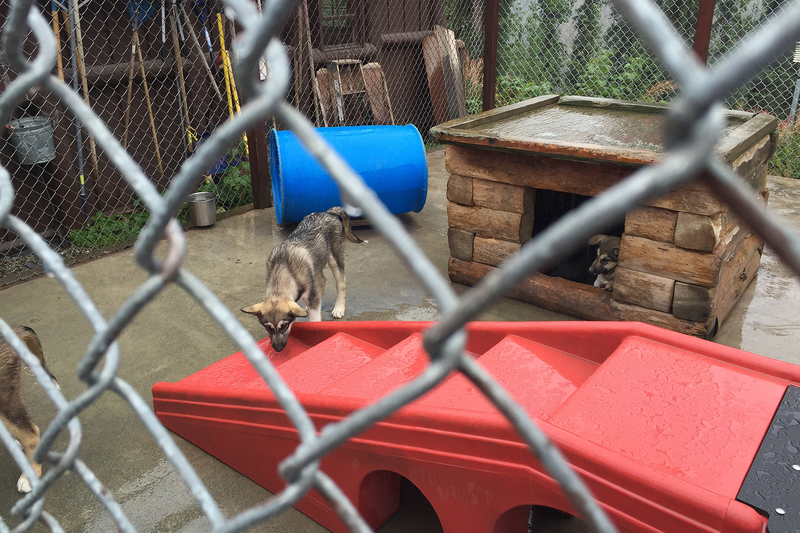 After our mishap on Mount Healy, Sean and I salvaged the afternoon of Wednesday, August 26 with a visit to Denali National Park’s sled dog kennels. 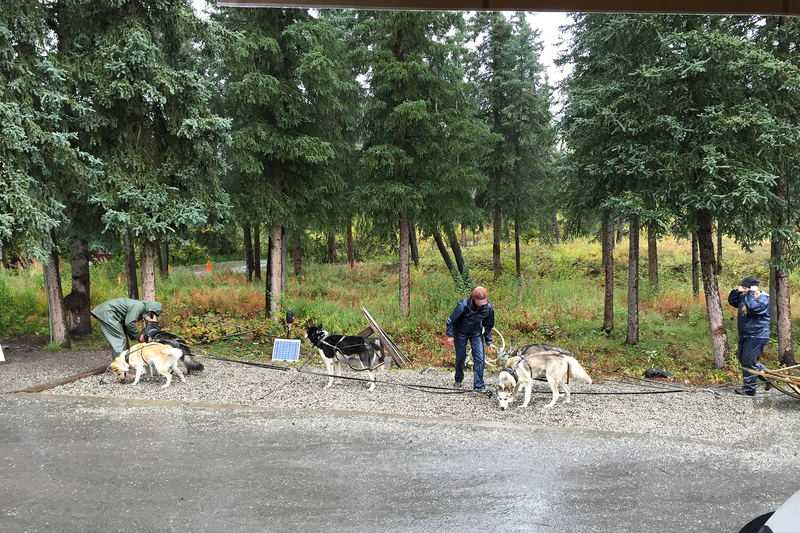 We arrived at the Park Headquarters parking area shortly before the 2pm dogsledding demonstration. 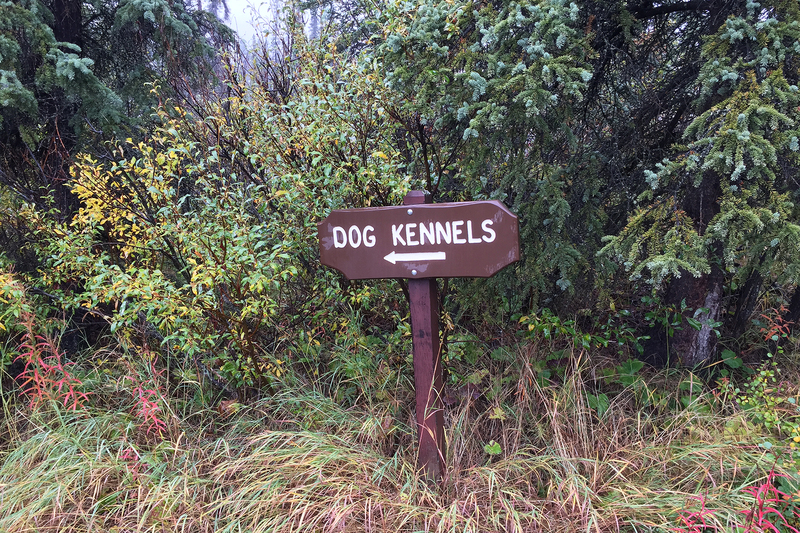 The use of dogsleds to patrol Denali National Park dates all the way back to Harry Karstens, who became the Park’s first superintendent in 1921 after it was established in 1917. In the winter, Park Rangers go on one-day to six-week long dogsled patrols of the inner two-million acres of designated wilderness, where motorized vehicles are prohibited. 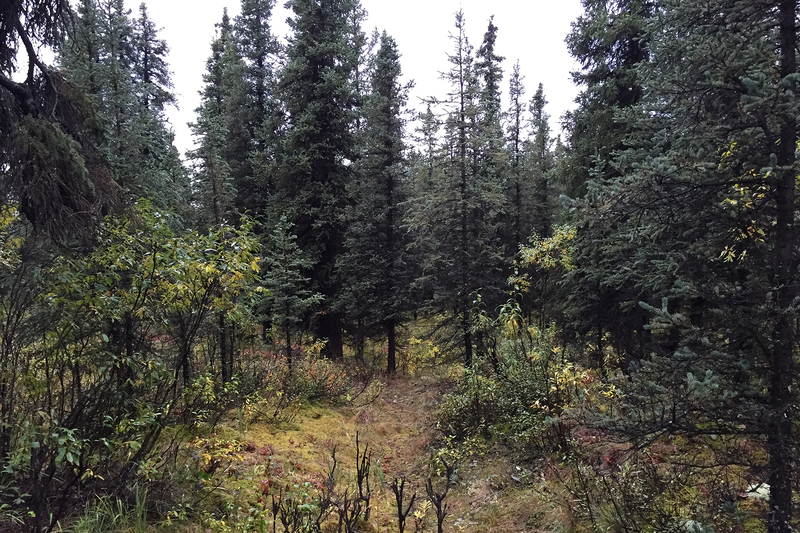 The patrols haul supplies, contact winter visitors, and prevent illegal activities like poaching and snowmobiling. I was chagrined not to have my DSLR, but at least we had our iPhones to be able to capture photos and videos. I also had my old, trusty Canon point and shoot, which I’d brought to Alaska specifically for our paddling adventure in Glacier Bay. 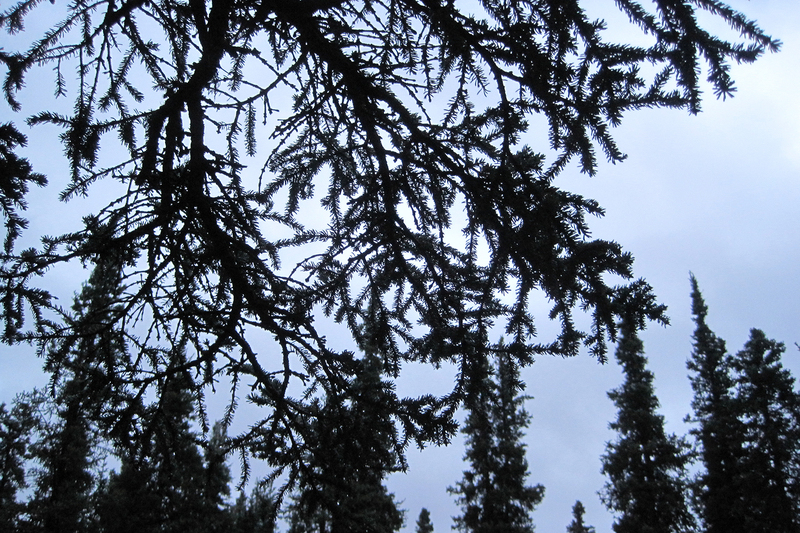 These would have to suffice until we got back to Anchorage and I had my big camera looked at. But if anything would cheer me up it would be the sled dogs. Visitors were grouped into two covered grandstands to protect us from the rain. The demonstration was introduced and led by a young woman who was a Student Conservation Association intern. She also drove the sled when it was time. As the kennel crew began to choose dogs for the demonstration, the kennel area erupted in barks and howls of excitement as each dog hoped to be chosen. 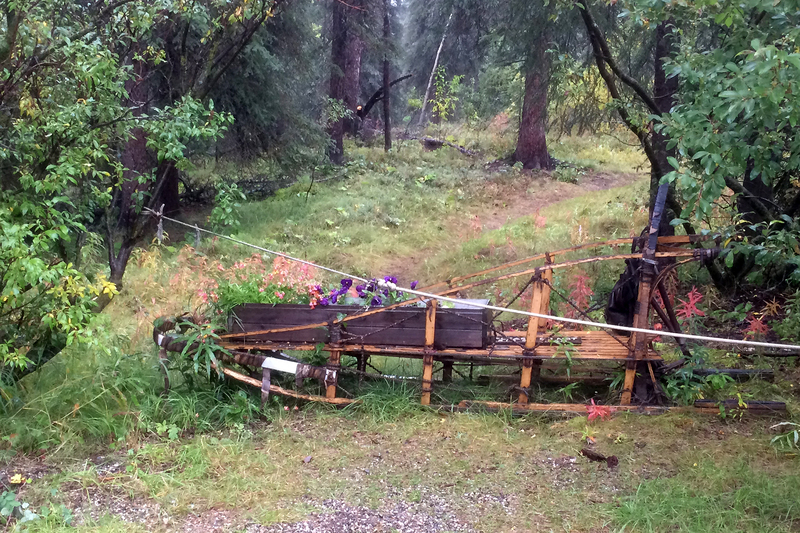 After a few minutes, six lucky dogs were harnessed to the sled at the start of the short track. They held for a moment as a worker chased a squirrel out of the sled’s path. Then, they were off! 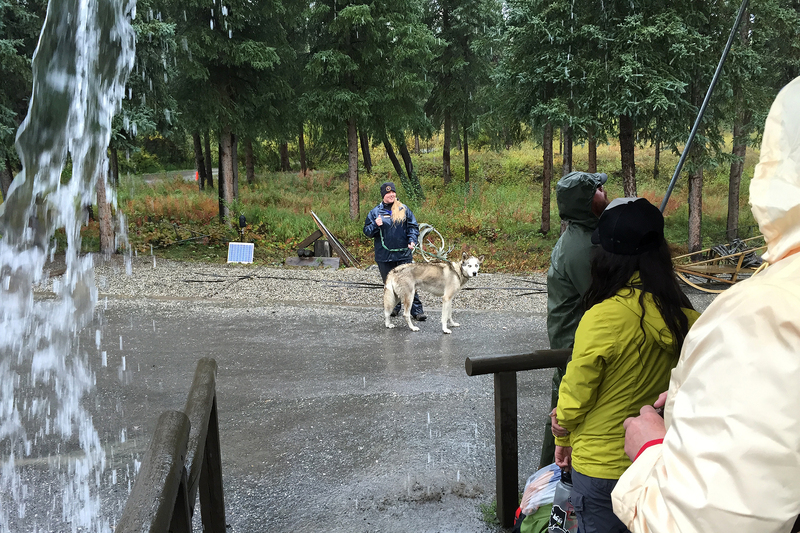 After the sled finished its fast run around the track, a Ranger knocked water off the audience overhangs while the crew unharnessed the dogs. Both as they were harnessed and as they were released, the crew members held the dogs up so that they were walking on their hind legs only. The dogs are so fast and so strong that it is the only way that humans will not get dragged along if they were to bolt. As they were released, after several hops, the crew members let go and the dogs raced back, one by one, to their houses. One dog, Sitken, was held back to meet the visitors. He was gorgeous, and Sean talks about how he and Sitken are now good friends. The park maintains a kennel of about thirty dogs with puppies born each summer that then begin training in the winter. 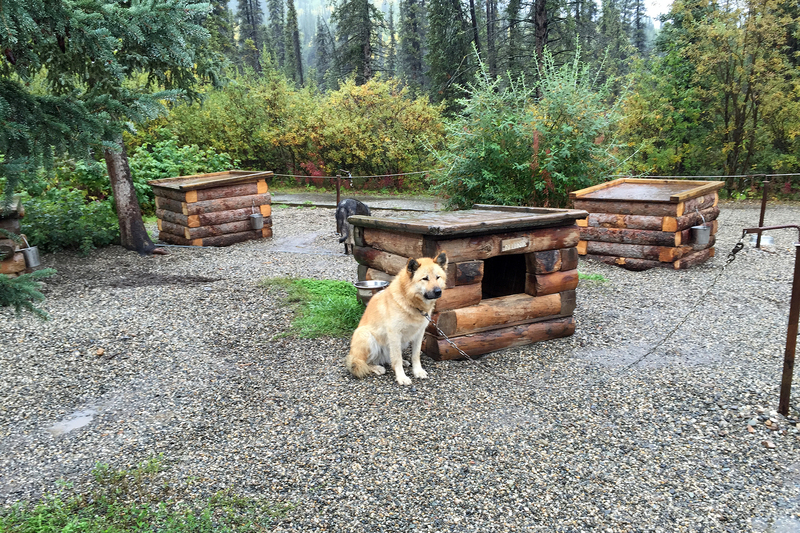 In addition to the dogs born at Denali’s kennels, dogs are occasionally acquired from other kennels and breeders. 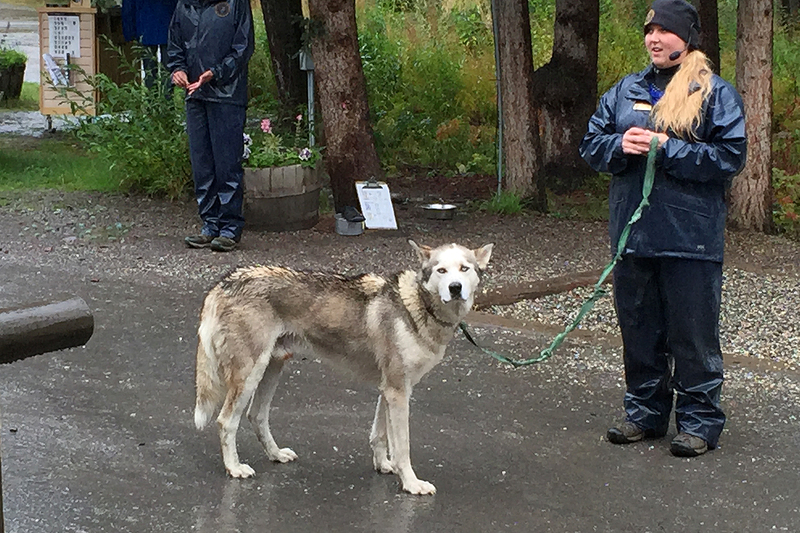 Generally, Denali Rangers want dogs that are big, strong, and hardy. They are not looking for the fastest dogs, since these are not racing dogs, but working dogs. 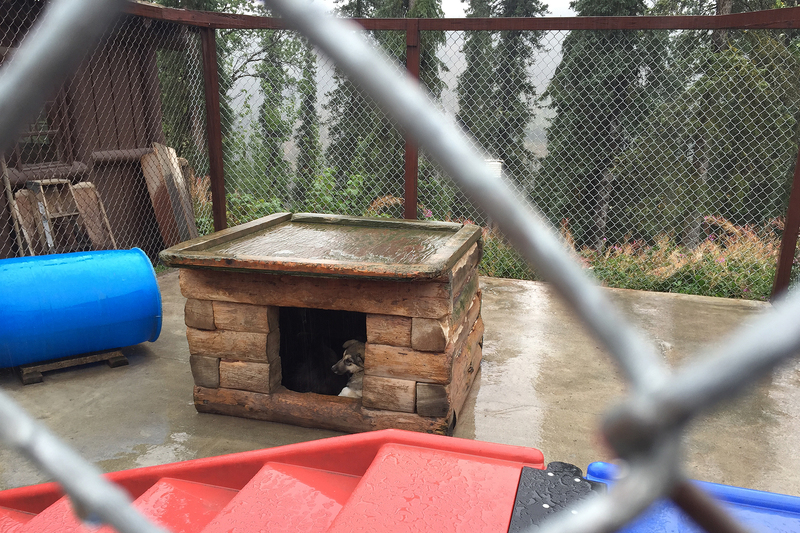 The puppies and younger dogs are kept in pens for their own protection, while the older dogs each have a house in the kennel yards. 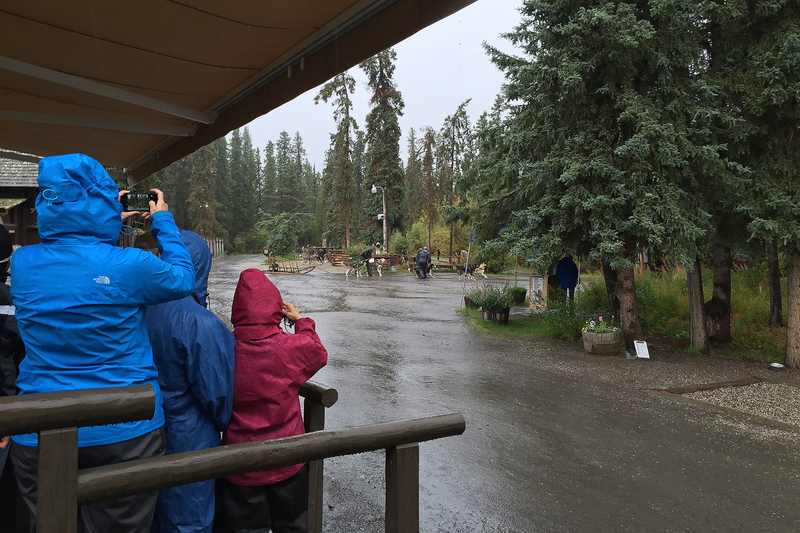 Although we’d already gotten our National Parks passports stamped for Denali at the Visitor Center, we both got an extra cancellation from the sled dog kennels. 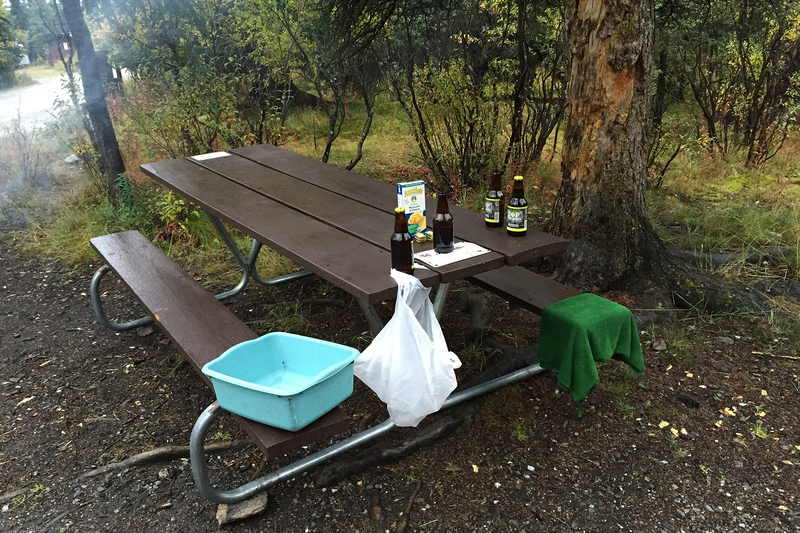 After the day’s excitement, we decided to return to Savage River Campground. 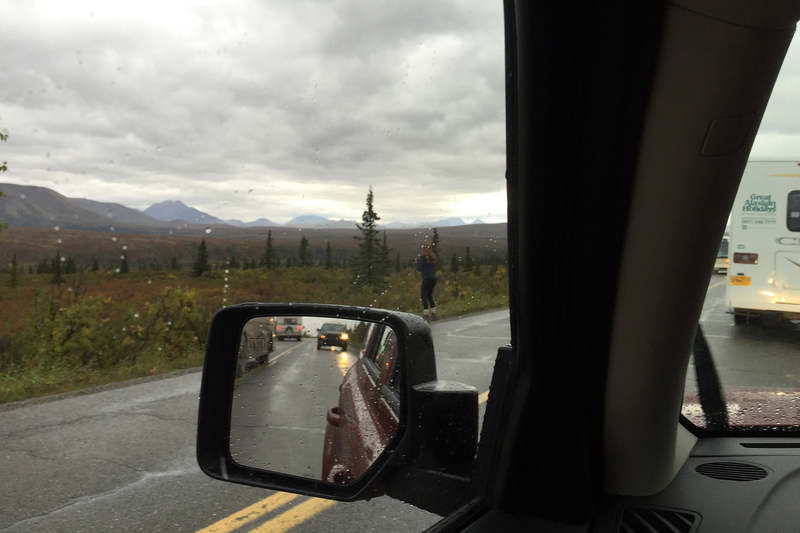 It took us longer than expected because of a traffic jam of vehicles stopped to observe and photograph wildlife. We never actually saw what everyone was looking at. Which means that, absent its being a wolf or wolverine (which was unlikely), we’d likely already seen a better view of whichever species it was. We decided not to go on another hike, but instead to head out of the Park in search of some sort of piece of meat to grill over the fire. 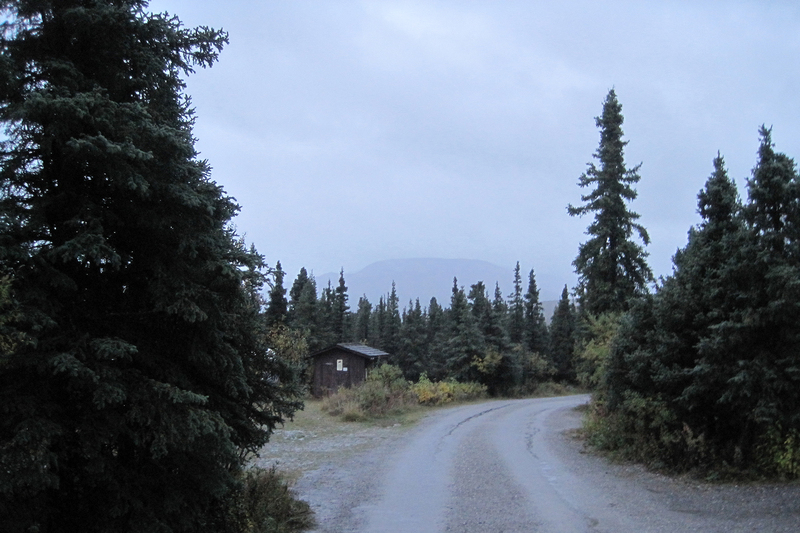 We turned north from the Park’s entrance and first tried some promising places in the cluster of lodges, stores, and restaurants near the entrance. We also got some gas. 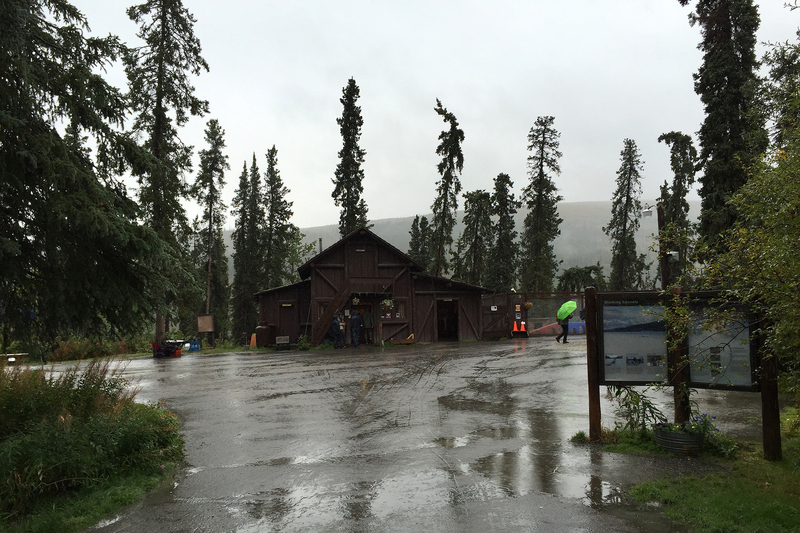 After we came up short, we drove north some twenty minutes along the Nenana River gorge to the town of Healy. We were expecting something slightly bigger, and blew right past town. 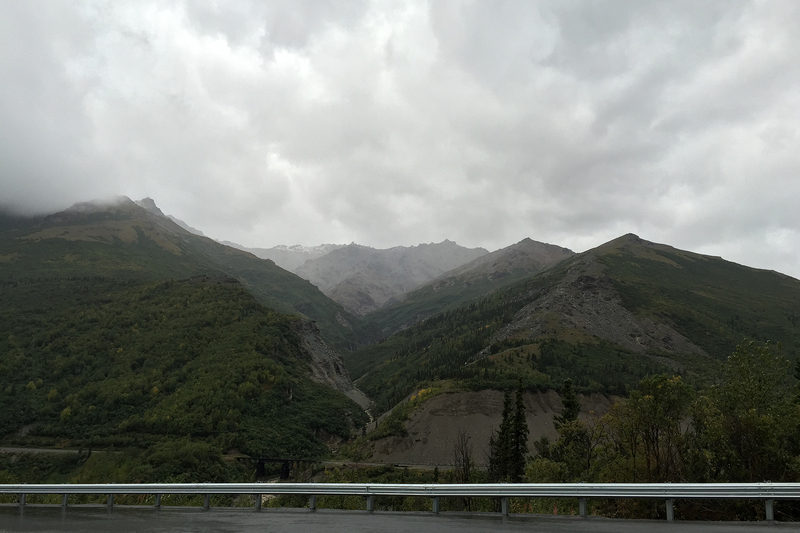 When we turned around at a side road from the highway, we wondered idly if one of these roads were the one that infamous wanderer, Christopher McCandless of Into the Wild fame, had used to access the northern part of Denali, where ultimately he would die. 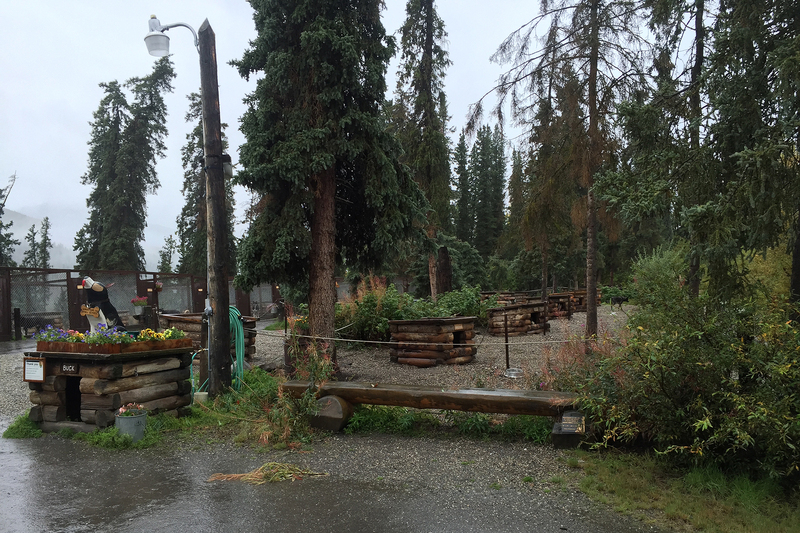 Back in Healy, the only thing we found was a small market. The only grillable protein they had were hot dogs similar to the ones we found in the mercantile at Riley Creek Campground in the park. Well, hot dogs it would be. The guys behind the counter were able to recommend to Sean a good beer, though, a double IPA called Hopothermia from Alaskan Brewing Company. Never much for hoppy beers, Sean was developing a craving for them in Alaska. 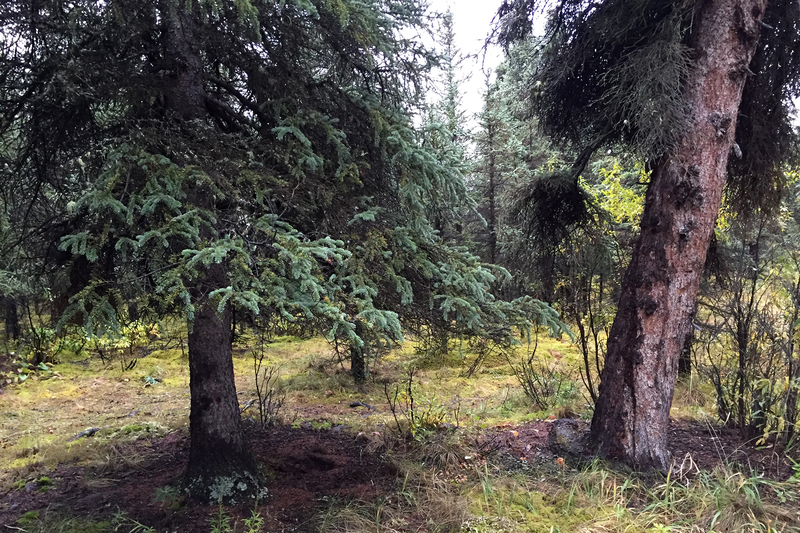 We returned to Savage River Campground, cracked open our Hopothermias, started a campfire, and settled in. 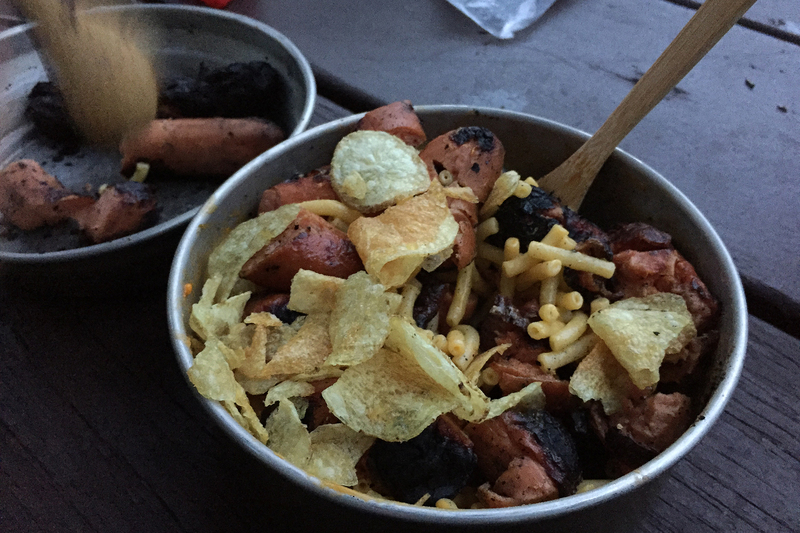 Ultimately, our supper was an amazing bowl of grilled hot dogs, macaroni and cheese, and potato chips washed down with beer. Cheers! 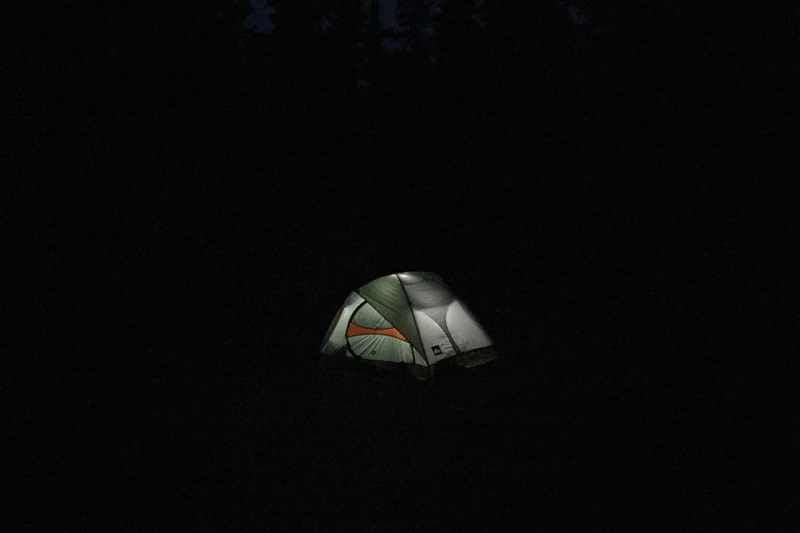 Before it got completely dark, campground host Liz stopped by. 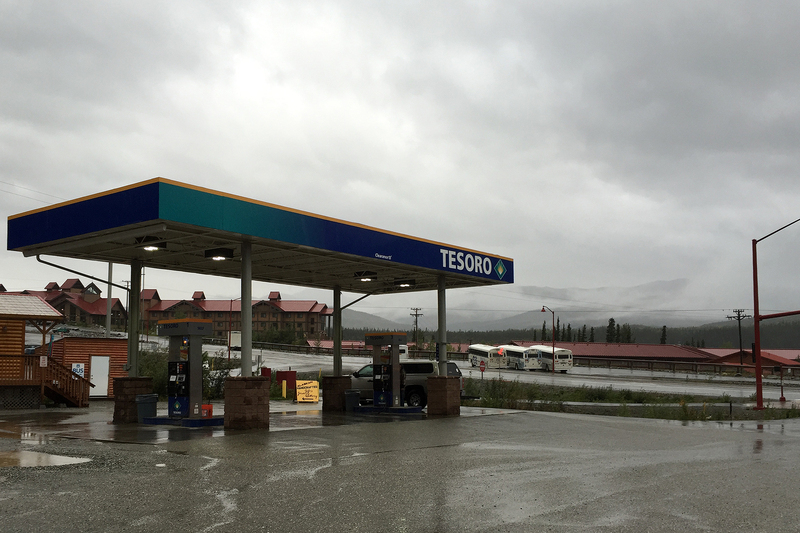 She advised us that the temperature was supposed to drop a bit that night and then drop precipitously the next day. We mentioned that we had camped in temperatures around 27 degrees before, and we were just fine. She pointed out that 27 degrees in Alaska is different than 27 degrees in, say, North Dakota because of the permafrost beneath the surface. 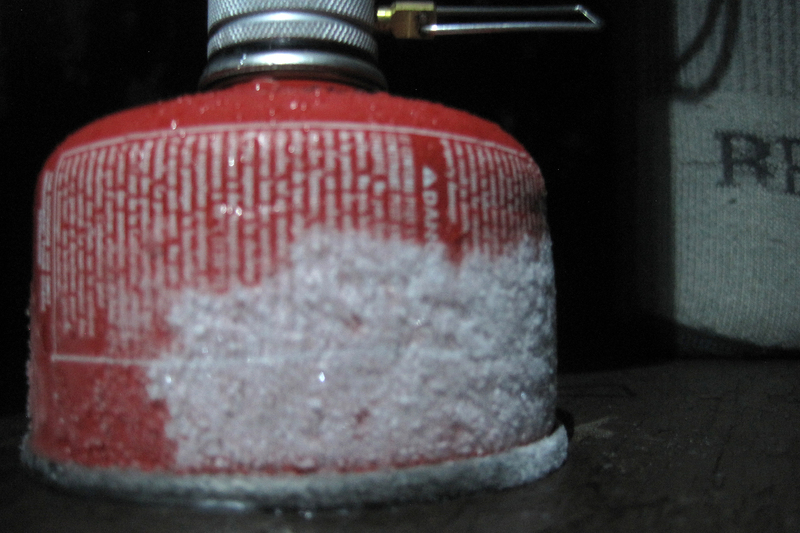 As we readied our hot water bottles that night, the backpacking stove froze to the table. 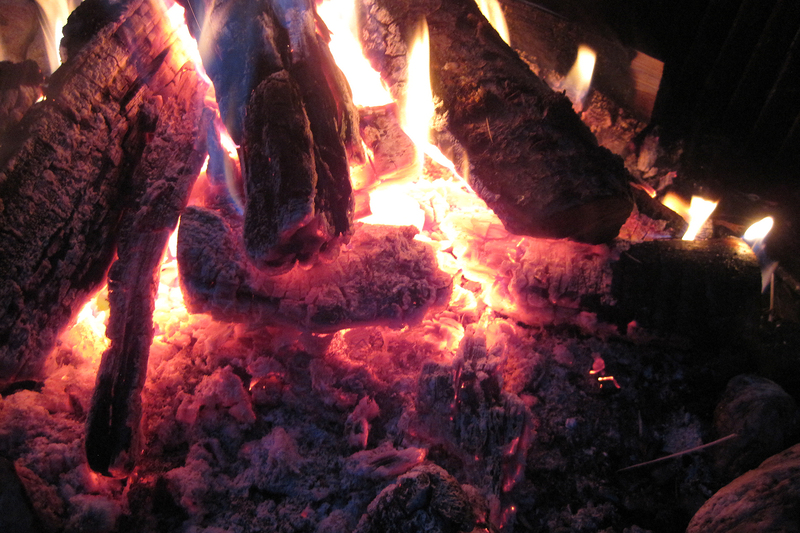 It was indeed a cold night in Alaska in our little tent at Savage River. 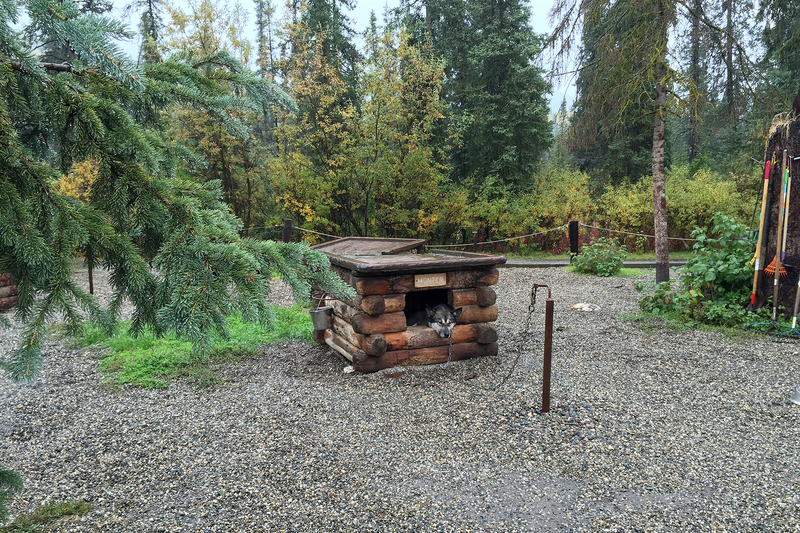 This entry was posted in Journey and tagged Alaska, Camping, Denali on February 17, 2016 by Brandon Hayes.